As a professional simulator constructor we are very happy to work together with SIMUCUBE. They had and continue to have a major impact on the Sim Racing world with their Direct Drive system. This construction is by far is the most advanced technology in the industry. This way we’re able to give you your desired product straight from our inventory! The Simtag Hydro Pedal system is fully compatible with the Simucube ecosystem. Since the Simucube got 5V analog docks, our Hydro Pedal System uses all of the resources. Enjoy the precise and absolute real driving experience! The Simtag Pedal is the perfect choice for the Simucube system. Purchasing both at the same time gives you a huge discount FOR YOUR PEDAL! If you order the new Simucube system with our pedal you’ve got yourself a 15% off from your Simtag Hydro Pedal System. Price is valid until withdrawal! 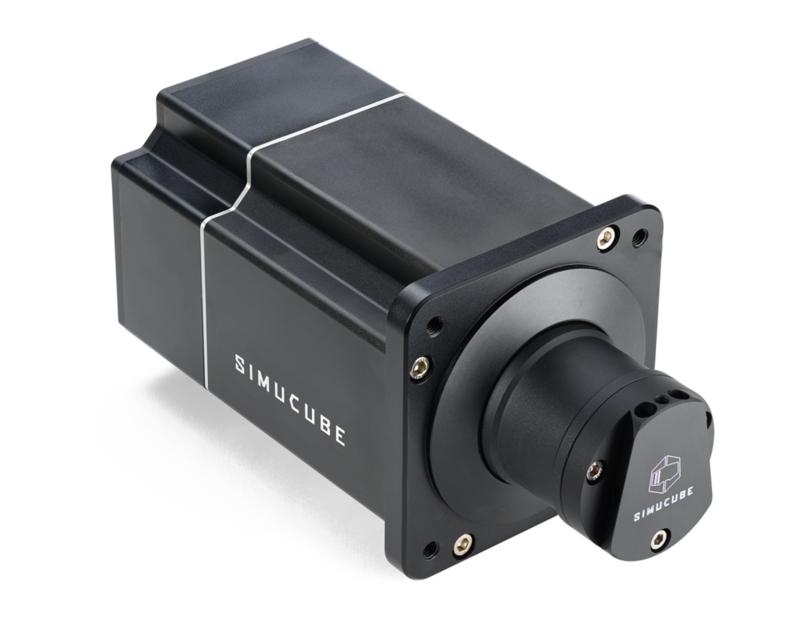 Simucube 2 comes in three models to serve the top-end spectrum of the direct drive scene. Specific models have been built to serve demanding Sport drivers as well as experienced Pro drivers. Hard-core drivers and professionals, who crave for experience outside of this world, are best matched with Ultimate which leaves no room for speculation. The systems been built around a precision robotics grade industrial motor, electronics and software fused together to form a flawless monolithic design. Everything is optimised to perform at the highest level, and with sub-millisecond latency. Sport comes with 17 Nm of direct drive torque and Simucube 2 benefits. This wheel base is a match for Sim Racing enthusiasts. SC2 Sport delivers serious amounts of juice to bring up adrenaline filled sweat to the skins of the drivers. Sport has comparable responsiveness and signal processing of the top-end models of world famous Simucube 1. Sport will be your key to the club of sim racing champions. The price doesn’t contain Shipping Costs and Payment fees. 25 Nm of torque is enough to give you deep immersion with any track, car and condition. With Pro one might forget they are in simulation. Combined with exceptionally high torque response rate Pro motor, the sharpest kinks will be delivered at a clarity not seen in Direct Drive scene before. Torque response rate is adjustable to driver's preferences. Abundant 32 Nm of torque and maxed-out torque response rate is at your disposal at anytime. Ultimate is based on Austrian made maximally dynamic industrial motor optimised for simulation. It's equipped with a 24 bit resolution Hiperface angle sensor to be fully utilised by the most advanced signal processing unit seen in simulators. Ultimate exclusively comes with advanced fine tunable signal processing to make the experience as personalised as humanly possible. This model was designed with "only the best is good enough" mindset. Simucube 2 Ultimate is our tribute to the Ultimate drivers.